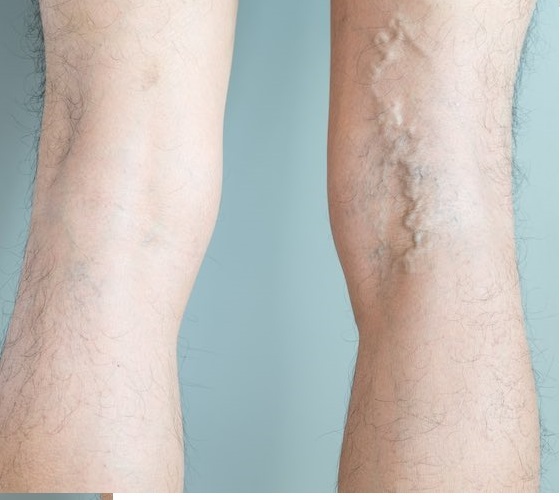 Varicose and spider veins on leg. Varicose veins happen in adults when blood in the vines flows in the wrong direction or settle out in the veins as a pool. The problems occur in legs and feet when the veins don’t work properly. The problem does not call for medical attention unless there is pain and aching the legs causing discomfort. 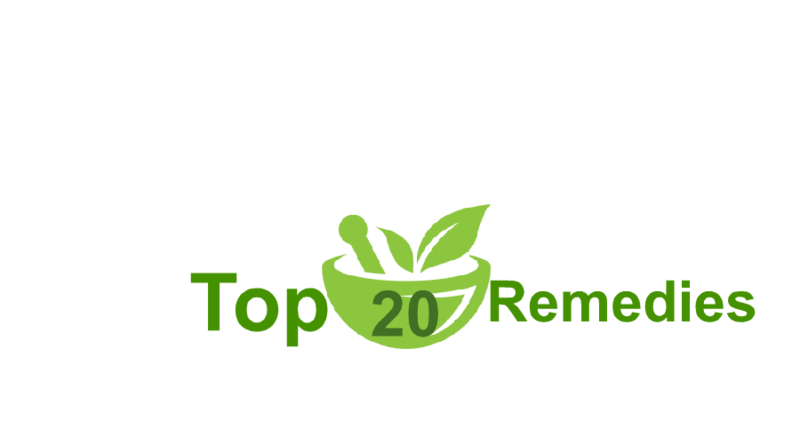 Of course, you can also try some effective home remedies to get rid of the problem. A person tends to suffer from Varicose veins when they have damaged valves. The problem occurs when these veins are not able to circulate the blood in the right direction. Veins in the body play a key role in circulating the blood throughout the body and bringing back to the heart. These veins have valves that are one-way flaps. Blood leaks happen in the lower part of the vein instead of going back to the heart. Over a period, the acclamation of blood increases in veins weakening walls of the veins. The problem occurs in the legs because only veins in the legs can carry the blood back to the heart against the gravity. 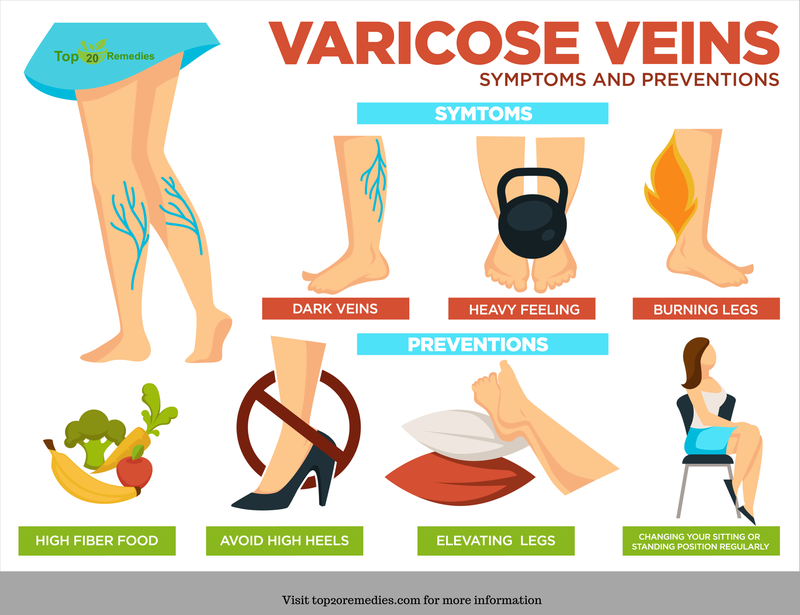 For a few people, Varicose veins can be a cause of cosmetic concern and for few, it can because of aching and discomfort. 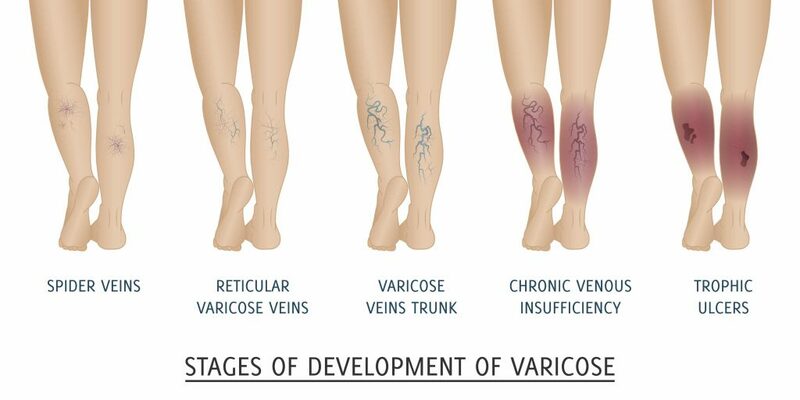 • Varicose veins can be identified through a few symptoms in the body. Exercise is the foremost remedy one think of for getting rid of Varicose veins. You should perform various exercises like leg lifts; calf raises cycling and side lunge to improve the muscle tone and reduce the effect of Varicose veins on your legs. You can also consider low impact exercise like walking, swimming and bicycling. Few may experience pain during the initial workout. You can try icing and heating to get relief from the pain. You can also elevate your legs to get relieved from the pain and ache you experience because of exercise. Compression stockings also create gentle pressure up and keep the blood flow smooth. Many oils are beneficial and work as an effective remedy for Varicose veins. There are many oils available in the market to increase blood flow and reduce the inflammation in the legs. 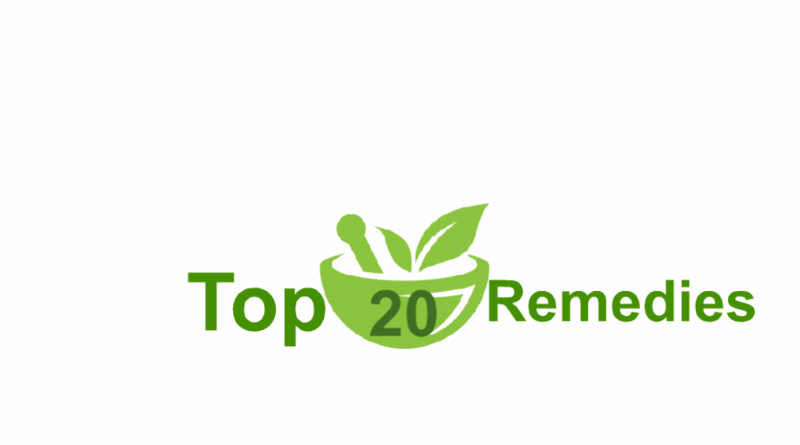 They also act effectively in reducing the hormonal imbalance. Cypress oil is named to be one of the wonderful oils to treat Varicose veins effectively. The oil has proven ability to increase the circulation and blood flow in the body. You can also try massaging with other essential oils like peppermint, tea tree, and lavender oil in small amounts to heal the pain. Garlic that is easily available in the kitchen turns to be an excellent remedy for Varicose veins. It works in reducing inflammation and improve blood circulation by breaking down harmful toxins in blood vessels. A combination of garlic, orange in addition to olive oil works effectively in putting off the pain from varicose veins. Take peeled garlic and add the juice of three oranges and two tablespoons of olive oil. Rest the mixture for 12 hours. Shake the jar before a few drops of the mixture and apply it on the soothed area to experience effective results. Parsley is a good antioxidant with abundant vitamin C encourages the production of collagen in the body. Parsley is a good source of rutin which has a huge role to play in building capillaries so; it turns to be an effective source for reducing varicose veins. Boil chopped parsley in a cup of water to boiling point and bring it down to lukewarm temperature. Add a few drops of essential oils and refrigerate it for several minutes. Apply the solution on the affected area several times over a period. Olive oil massage can be an effective home remedy for Varicose veins. It helps in treating the underlying cause of the problem. Massaging the olive oils in a combination of the essential oils will improve the blood circulation in the veins of the body and reduce the effect of Varicose veins on legs. Apple cider vinegar is a natural body cleansing product so, it works effectively in treating Varicose veins. It is known for improving blood circulation in the body. When the blood flow increases, swelling of the veins decrease naturally. You should apply the undiluted solution in the affected area and gently massage the area. Follow this remedy before going to bed and repeat the process every morning. Practice this method for a few months to see reduced veins. Tomato seeds are a good source of salicylic acid which works effectively in treating inflamed veins by preventing blood clots and improving blood flow. They are also rich in lycopene that concretes cells and prevents damage to lipid cells..on applying on the skin tropically reduce the inflammation of damaged cells. You should cut two tomatoes and make them into paste without losing seeds. Apply the puree on the affected area 3-4 times a day for two months to experience effective results. Cayenne pepper is a rich source of vitamin C and bioflavonoids. The herb encourages fibrinolytic activity in the body and prevents the formation of blood clots and helps in treating Varicose veins. Mix one tsp of power herb to the cup of water and stir well before you drink. Consume it for three times a day for effective results. The herb witch hazel is rich in abundant medical properties from tannins, essential oils, and flavonoids. It is also good at treating skin problems like eczema and psoriasis. The herb also has properties to strengthen veins and also act as good anti-inflammatory. The medical property tannins help in tightening distended veins and repair their normal structure. It also acts as a mild sedative to relieve pain and discomfort associated with the problem. Soak WASHCLOTH in witch hazel and place it in the affected area to get relief from the pain. You can also fill the tube with the lukewarm water add 15 drops of distilled hazal and soak your legs for 15 minutes. The veggie cabbage is a source of insoluble fiber and beta carotene vitamins. When these antioxidants touch the affected area, it passes through veins and helps the blood clot thus stopping seepage of blood. Chop three leaves of cabbage into small pieces and blend them mixture to extract juice from it. Apply the juice tropically for 3 times a day to experience noticeable results. Apple Vinegar has abundant protein enzymes and friendly bacteria. It can also kill harmful bacteria to prevent them from multiplying further. Alovera gel is a source of salicylic acid and other antiseptic compounds that kill pain-causing bacteria. It is a full pack of enzymes that work together to reinforce the skin barrier. Carrot is a good source of the beta carton that helps in repairing the damaged skin tissue. Grate the carrot and extract juice from it. Mix aloe vera gel, apple cider vinegar and carrots in 1:1:1 ratio. Apply the mixture in the affected area with the cotton ball at least three times a day for a month. Obesity is also a good reason for most of the adults complaining about Varicose veins. This is the reason why most of the staffers of the problem are elderly people or women who are obese. Heavy puts a great deal of pressure on veins in the legs, and this contributes to inflammation in veins. It is said that it is challenging to treat Varicose veins in the obese people as they go unnoticed till they are inflamed to the fullest. Maintaining a healthy weight is, in fact, a preventive act of the problem. Of course, there is no way to prevent Varicose veins completely. You can, however, reduce your risk of developing the diseases by improving your circulation and muscle tone. You can do exercise, become the watchdog of your weight, consume high fiber food and have a low salt diet, big no tight hosiery and high heels, change your sitting and standing position often.